Three-time Paralympian Curtis Thom (Athens 2004, London 2012, Rio 2016) continues to be a true inspiration. Firstly, Curtis served as our Timmy in 1998, so how cool is that! Then, as a wheelchair racer, Curtis keeps his drive going living by his personal saying: BELIEVE IN YOURSELF. LIVE YOUR DREAMS. He captured Bronze in the men’s 4 x 400-metre relay (along with Brent Lakatos, Tristan Smyth and Alex Dupont) at the Rio Paralympics. That came following surgery in 2015 to repair his ventricular shunt (a device that prevents fluid from building up in the brain). Curtis was born with spina bifida and hydrocephalus. He had four operations in the first 10 days of his life and although he had learned to walk by age two, a growth spurt while he was still a small boy meant he required further surgery for a tethered spinal cord. He has used a wheelchair ever since. After watching the 1996 Atlanta Paralympics he was fascinated with wheelchair racing which he began that very same year at the age of 10. Curtis proved he belonged on the Rio Paralympic squad with his successful return from surgery in 2015. 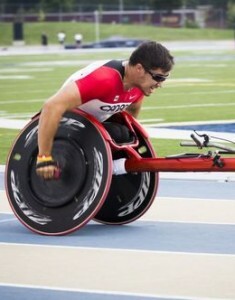 At the 2016 nationals in Edmonton he won the T54 100, 200 and 400-metre races each by 0.25 seconds or less and was named to Canada’s Rio Paralympic Games Team. Born in Burnaby, B.C., Curtis moved to Mississauga at the age of four. He was the Ontario Wheelchair Sports Association Male Athlete of the Year in 2001, ’02 and ’03 and the Mississauga Sports Council Disabled Athlete of the Year in 2001, ’03, ’08 and ’09. Thom also won the 2003 Athlete of the Year award for the City of Mississauga.